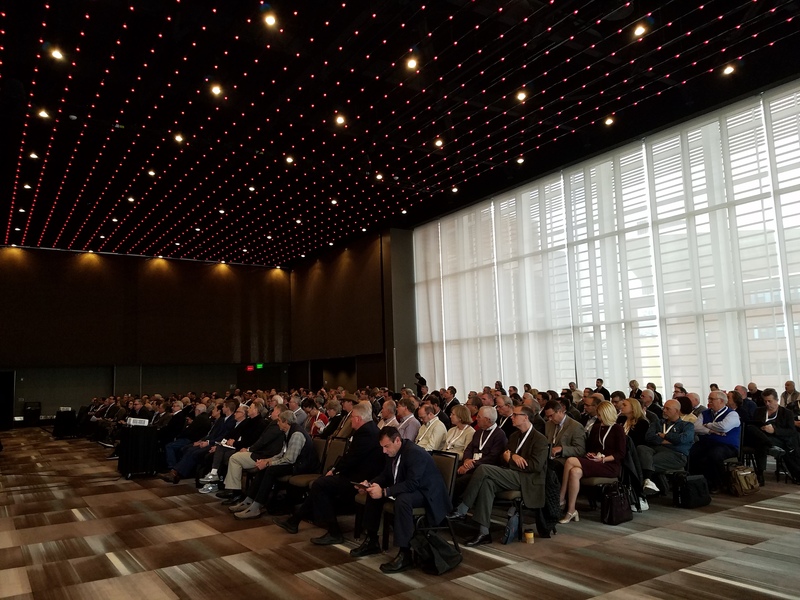 If your office was a little quiet at the end of last week, perhaps your colleagues were participating in the 2017 AIA QUAD States conference in Albany, New York. This program was a joint venture between AIA New Jersey, AIA New York State, AIA Pennsylvania and AIA Connecticut. The evening before the conference, AIA board members from all four participant states were invited to a dinner on Wednesday, the 8th of November. This event was very well attended by over 80 people. AIA New York State president Robert E. Stark, AIA welcomed all of the guests together with their executive director, Georgi Ann Bailey, CAE. Thursday morning kicked off with AIA New Jersey members participating in their very well attended board meeting. State president Ben Lee, AIA, presided and welcomed AIA National president Tom Vonier, FAIA, and 2019 national president, William Bates, FAIA, to join the meeting and share their perspectives on the Institute and profession. At this meeting, AIA New Jersey’s executive director Joseph Simonetta, CAE, gave us a summary of what changes we might anticipate based on the results of the election earlier that week. Our Regional Representative, Bruce Turner, AIA, also provided an update on happenings at National and progress since the last AIA NJ Board meeting. Incoming AIA NJ president, Verity Frizzell, AIA, advised us that she has everything well in-hand for the transition at the end of the year. Seth Leeb, AIA, New Jersey’s QUAD States conference chairman, said he was very pleased with the registration from New Jersey. The conference offered a full three days of tours, seminars and social activities featuring the Friday Expo floor, which was completely sold out. For any members who had not been to Albany before, they were in for a wonderful surprise. The compact city is chock-full of interesting history and architecture, and AIA NYS secured the most experienced and knowledgeable tour guides. That is not to say that our fact-filled, AIA NJ PA Committee Co-Chair Bill Martin, AIA was not able to correctly expand upon the statements made by the guide on more than one occasion. 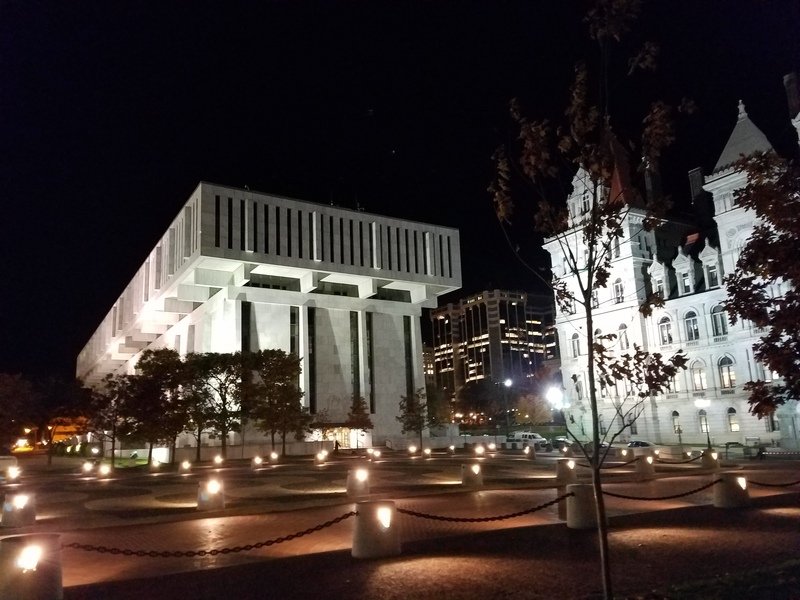 Our members participated in tours that took us to the New York State Capitol building, SUNY Polytechnic institute’s Zen Zero Energy Nanotechnology building, EMPAC, University at Albany School of Business, the Philip Schuyler mansion and The Egg Performing Arts Center on the Empire State Capital Plaza. Friday afternoon, AIA New Jersey president, Ben Lee, AIA and co-workers Michael Ferment, AIA and Andrew Lewis, AIA, all of NK architects in Morristown New Jersey, presented a seminar entitled How Architects can Lead Change for Health and Wellness to the Built Environment. This program was well attended and provided an engaging learning experience for new ways to consider designing for wellness. Thursday evening, all registrants were invited to attend the QUAD States Design Awards presentation and opening night party held at the New York State Museum. 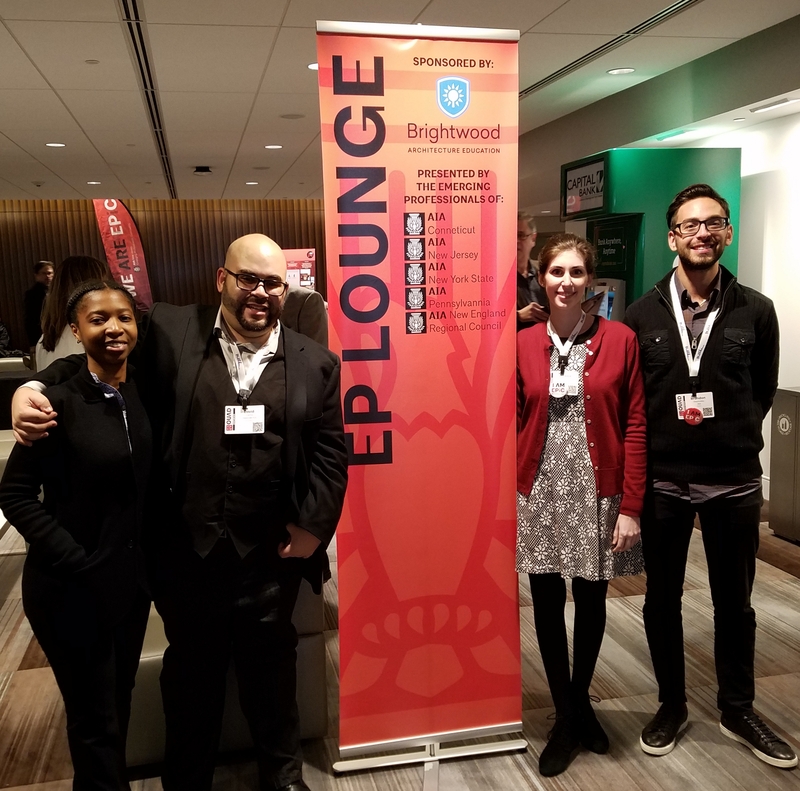 New Jersey was light on submissions for awards, but our members did attend the ceremony a-plenty and had a great time at the party. Some even rode the carousel! Friday morning started off with the early morning Spec Academy and then rolled into a series of continuing education programs. The highlight of the Friday schedule was the opening of the Expo floor with over 80 exhibitors from across the region. Exhibitors commented on their satisfaction with the event, meeting plenty of architects and allied professionals. 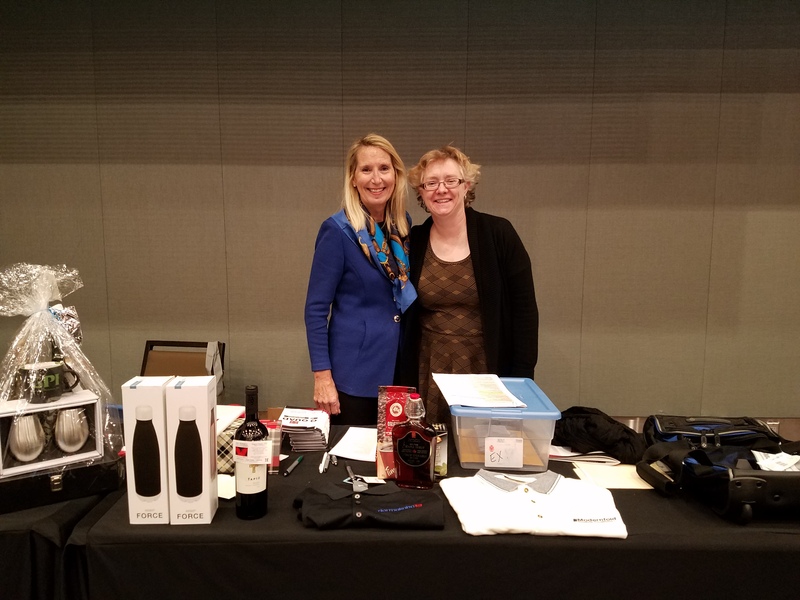 Right before the Expo closed, AIA New Jersey management staff Laura and Lisa from PSI drew the lucky winners’ names for the distribution of Expo Contest prizes. They really enjoyed seeing the smiles on the faces of all the winners. 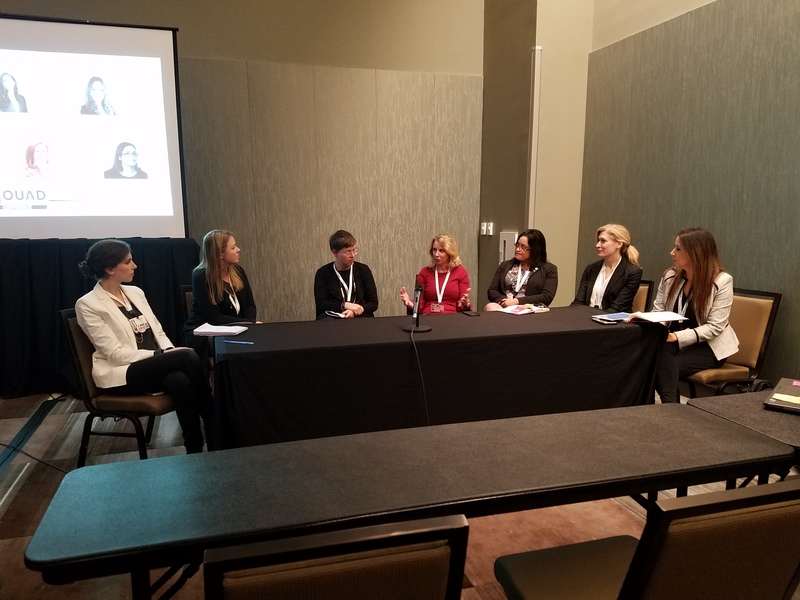 Later that afternoon, AIA New Jersey executive board members Kim Vierheilig, AIA and Jessica O’Donnell, AIA participated in a panel discussion about Designing your Career Path through Equity, Engagement, and Leadership. This panel was filled with women leaders in architecture from each of the host states. Following that, Friday night included a conference cocktail party in the Capital Center, an emerging professionals party and the New York State Design Awards reception. AIA NJ members that forgot their tuxedos gathered at The Merry Monk for a casual, festive dinner! On Saturday, AIA New Jersey Young Architects Regional Director Jessica O’Donnell, AIA and Regional Associates Director Brandon Warshofsky, AIA, each were part of an educational seminar. Jessica’s was entitled Activating the Next Generation of AIA Architects while Brandon’s was called Emerging Advocates: Ways to Get Involved. The convention also featured three outstanding keynote presentations. The first was presented by Steve Dumez, FAIA, of Eskew + Dumez + Ripple in New Orleans, LA. On Friday, members were treated to a healthy workplace presentation by Leigh Stringer from EYP in Washington DC. Saturday morning, our members learned about Automation in Design, Design by Automation by Michael Pryor, Pavlina Vardoulaki and Li Chen, all from Design Morphine in New York City. 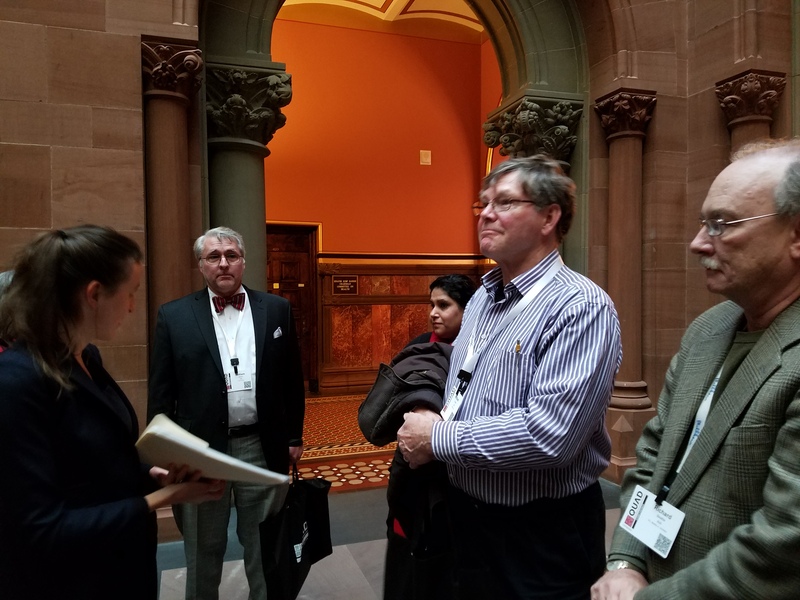 While this conference was much smaller than a National Convention, with only 300 attendees, it offered a diverse, invigorating schedule from an educational perspective as well as for sightseeing and learning about the architecture and history of Albany. The city was a great setting for this event, allowing for ease of transfer from the two featured hotels to the Capital Convention Center and beyond, to external tour sites. Everything is very compact and the city is clean and quiet. New Jersey had around 60 members attend this event that replaced our annual Design Day program, and it was a success from every vantage point. Thank you to everyone who made this possible! All photos by Stacey Ruhle Kliesch, AIA, unless noted otherwise.